The Isle of Balfiera is an island region within the northern portion of Iliac Bay. In the late Third Era, the largest settlement was the town of Upvale, the dominant vampire bloodline was Lyrezi, and the regional deity was Akatosh. Balfiera was known as a neutral meeting place for the kingdoms of High Rock, who used it to facilitate negotiations and treaties. 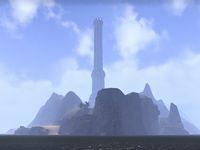 However, the isle is most renowned as the site of the Direnni Tower, formerly the Adamantine Tower, the oldest known structure in Tamriel. Legends say it was constructed on the "little island" by the gods themselves so they could hold their own negotiations. The title for the ruler of the isle is the Castellan of Balfiera, derived from the title originally used for the commander of the tower. The isle was an independent, unconquered territory before the events of the Warp in the West, after which it fell under the dominion of one of the four surviving kingdoms of the Iliac Bay region. The island came into the hands of the Direnni Clan in the early First Era when Ryain Direnni bought the Isle of Balfiera. The mother of Pelagius the Mad, Utheilla, was of the Direnni blood and brought Pelagius and his siblings here as she fled from the assault brought upon Wayrest by Uriel III and Queen Potema of Solitude. Shortly before the Warp in the West, the island was ruled by Medora Direnni. For game-specific information, see the Daggerfall article on the Isle of Balfiera.